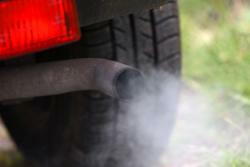 When a muffler functions properly, your car stays quiet and the muffler reduces air pollution. But if you’ve ever heard a loud sound coming from your muffler, that’s a good sign that the exhaust system probably needs a repair. Do you know where your exhaust emission system is located? It starts at the front of your car, just behind your engine. Connected to the cylinder heads are the exhaust manifolds where exhaust gases are collected. Oxygen sensors analyze the gases that pass through the exhaust system, and then are refined by the catalytic converter. Finally, they are quieted by the muffler, so your car runs cleaner and smoother, with the sound muffled: a pretty complex system that, when noisy, can signal an embarrassing.problem or worse. At Honest-1 Auto Care, our expert mechanics are pros at detecting issues and getting you right back on the road, as quickly as possible. We are a fully-licensed, insured, and state certified muffler shop that is also environmentally sensitive, which includes recycling parts, batteries, and oil. We also have a comfortable waiting room with TV, free WiFi, and a play area for children. When you need your exhaust system or muffler repaired, come down to our exhaust shop at Honest-1 Auto Care in South Elgin, IL or give us a call today. We're here to serve you.